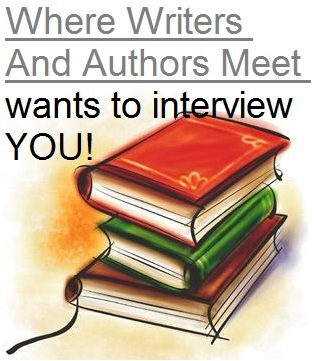 The Where Writers And Authors Meet Blog! Come Ask K'Anne Meinel Some Questions! K’Anne (and yes this is her name and not a contrived name) writes books she would like to READ. She writes stories (as in short) that fans have asked for and for the exercise of trying something she may not be comfortable in writing. It expands her horizons to write outside her comfort zone. She likes creating whole characters as well as ‘quickie’ stories where she never names the participants and the reader places themselves in the story. As her short story readers read and realize the depth of the longer stories and then get introduced to her books she hopes they come to love the characters she has developed. She has found writing to be a multiple personality experience, these characters live inside of her mind and to exorcise them from her brain she put them down on paper (not literally). That way, they are preserved for all time. She is ALL of her characters and yet, NONE of them. The feedback she has gotten from her readers is amazing, the vested interest in the stories and books, she doesn’t think anyone can NOT love hearing how a story made them laugh, cry, and fall in love, how they felt a similarity in their own lives, how they relate. It really makes the reader a part of the story they are reading. K'Anne's Interview will go live On April 22nd so do your research and come ask her some questions! Since she was a little girl, Wendy Miller's imagination has run away with her. Putting the stories her imagination dreamed up on paper was the only way to get them out of her head. Being able to publish her stories and share them with others has always been her dream. As a single mother raising two sons and working full time, she had to put that dream on the back burner for several years. Then she was laid off from a job she enjoyed and, like many others at that time, had no luck finding a new job. 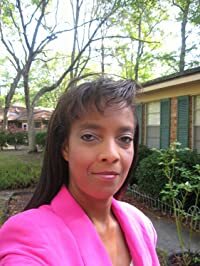 With "free" time on her hands, she began writing again and decided to look into the self publishing route. "Tangled Deceit" was her first completed novel ready for publication. She is often working on more than one book at a time, because her creativity has ADD and cannot focus on just one thing at a time. 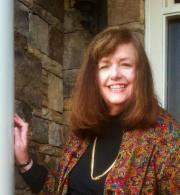 She writes romance and romantic suspense novels. Her second novel, "The Secrets He Kept", will be published in December 2012, and she is hard at work on her next book. Wendy lives in Central Florida with her two sons. Along with her writing, she also homeschools her sons. When she's not busy teaching or writing, she enjoys reading, watching television and movies, listening to music, swimming and photography. She loves watching crime shows such as CSI and Criminal Minds, as well as shows like Sons of Anarchy and Survivor. When it comes to reading - anything goes! Wendy's Interview will go live On April 15th so do your research and come ask her some questions! Come Ask Melissa Harvey Some Questions! Melissa Harvey, a Baton Rouge native and former pastry chef, is the creator and publisher behind CajunSugarPie.com. She's a self-proclaimed chocoholic and lover of all things sweet. She currently lives in Nashville with her songwriter/musician husband and their two daughters. Melissa Harvey does not currently have a website ;). Melissa's Interview will go live On April 8th so look her up and come ask her some questions! 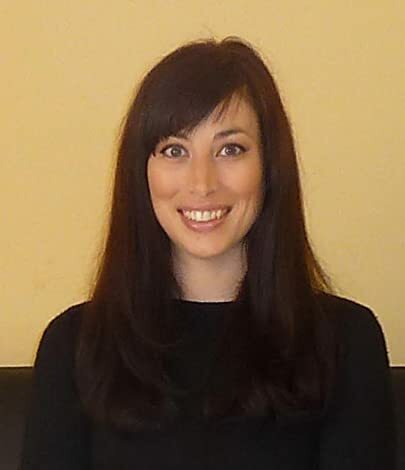 Brae Wyckoff was our Featured Spotlight author last week and vistors were encouraged to ask Brae some of their own questions! Here is a link to that Spotlight! Feel free to ask more questions, and we might just be able to get Brae back for a follow up interview! Hey Brae, tell us how you crossed paths with Aileen Aroma, and what would we have to do to pry her away from you so she could promote our books? Great question Jim! From my standpoint as I cannot speak for Aileen, was I had been marketing all my work for a couple of months which was completely zapping me of writing. I literally stopped myself and prayed to God to send me help. Previously, in the month of December there was something started on Facebook called Adopt an Author. I signed up and a wonderful woman by the name Cheree adopted me and really helped me in several areas. We are still good friends to this day and she is now a huge part of my Orb Street Team. Now, this program was so successful that it sparked another go around for authors. I signed up again and this is where Aileen came into the picture. She will have to tell her side of the story, but she was an answer to my prayer. The rest is history. 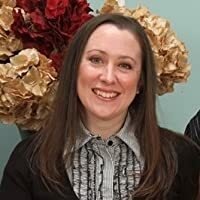 She has been working with me ever since, creating the Orb Street Team, the Official Orb of Truth Fan Page, and helping me achieve great success on Goodreads lists and much, much more. Beyond this though, she has become a dear friend of mine. We have both learned a lot about social marketing and what it takes to make a successful campaign for any author. You can’t have her, Jim! LOL!!! No, seriously, please contact Aileen Aroma on Facebook and she will give you an affordable package to help an author achieve success. I'm wondering what sort of gaming you do. Do you play sci-fi/fantasy games? I grew up playing Dungeons and Dragons and Star Wars roleplaying games. It started in 9th grade for me with a group of friends bringing me into their inner circle of nerdiness. Today, I continue to play as a form of research for my books and to keep the creativity fresh in my mind. 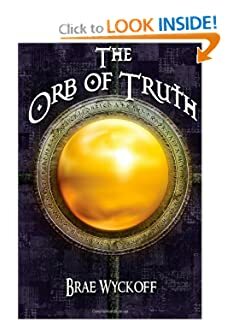 How long did The Orb of Truth take you to write? It took me six months to write The Orb and my 2nd book, The Dragon God. I outline each one from beginning to the end and then slave away until it is written. It takes an additional year for re-writes, critiquing of the work, and final editing. Did you have trouble thinking up the different species in the book, their looks, and mannerisms? A lot of times you don’t have to re-invent the wheel so I will take existing creatures and make them my own. Even simple things such as cows are called cowpecks or sheep now being shepps. These subtle inclusions of what is familiar to us yet slightly different can pull us deeper into the world. Monsters are fun though and take on a whole new flavor for me. I want them menacing and truly monstrous…something that comes from nightmares and are not fluffy. D&D has been a huge help in this department, but I always make them with my own spin. Do you only write/read fantasy? I currently only write fantasy as this is my passion. A writer should write what they know and where they are comfortable but at the same time push themselves deeper within their chosen genre. You will see great improvement of the stories and the world I have created in each book release. I read a lot of fantasy as I love this genre but I venture out into mystery, comedy, Christian fiction, etc. I love to see other authors work and it helps me also to become a better writer. Where does your passion for the supernatural come from? Have you always been drawn to it or did it develop with time/after a certain event? I have a strong pull for the supernatural. My wife and I have a website dedicated to the miraculous occurring daily around the world. It is called The Greater News (www.thegreaternews.com). We are Christians who walk in the miraculous and have seen first-hand supernatural healings. We were not always like that, but it did come about through a particular personal event revolving around my wife. She was diagnosed with an incurable disease called Celiac. It is extremely debilitating and life threatening if not controlled through a strict diet, a gluten free diet. My wife received prayer and was healed. It was doctor verified. This one event changed our lives and launched our ministry into the supernatural. I love to bring the supernatural into my stories. Do you think there will ever be a time when you will want to try writing another genre of book than you are now? It is possible that I will venture into space opera writing similar to Star Wars. I have a deep passion for the universe created by George Lucas and you might even notice a few nods to the saga within my books currently, albeit subtly. I’m attracted to the classics: Dragons, Unicorns, Medusa, and the minor creatures like Trolls, Goblins, Orcs and so on. All of these have roots within my D&D days. What sort of games were you first interested in? Things in the gaming world were just a little different in 1985. I started playing Advanced Dungeons and Dragons back in the 80’s which branched out eventually into West End Games Star Wars RPG system utilizing die six mechanics only. The early games were archaic but tons of fun due to the immense amount of creativity and imagination required to pull it off. These games in essence created the writing monster inside of me. I went through multiple variations of the above as the owners of the games changed every couple years to enhance the game play. We all forked out our money each and every time, well I actually bummed the money from my parents or spent my working money earned. I did whatever it took. From Lee Ryder: You are a pastor are there biblical themes in the Orb of Truth? Did you also know that there are biblical themes in the lord of the rings trilogy did these themes inspire you in the writing of the Orb of Truth? There are indeed Biblical themes woven throughout my books. I write what I’m passionate about but at the same time attempting to be realistic with the thoughts of characters and their reactions and ultimately, their choices they make during their life. It has been a while within the Christian community, and to the world for that matter, to have an author bring an epic adventure to light like the greats did…Tolkien and CS Lewis. Don’t get me wrong, I never imagined being compared to them but review after review on Amazon keeps coming back to the greats and I’m humbled to be compared. I am completely inspired by their success as authors and especially as storytellers. I’m all about story and characters in my books. So Mr. Wyckoff who your favorite character in the Orb of Truth? And which one if any would you say was a representation of you or what you want to be like? My favorite character is Bridazak, the main hero of The Orb of Truth. He is a Halfling, similar to what we see in Lord of the Rings and The Hobbit. In my world, I have changed their race to an Ordakian which is a new term for Halfling. This is my attempt at having my own voice and bringing something fresh to the table even though I am not changing the racial personality of the Halfling. Bridazak represents me because he is in search of who is, in search of his destiny, and longing for something more to life. Dulgin the Dwarf is a runner up as a representation of me as some of his surly antics are part of me in some ways. Now, I am not as headstrong as he is but there are scenes that directly have been identified as being me to the tee, especially for those who know me well such as my family. Why do you write about creatures that's considered the devils minions? One cannot have good without the evil. I write the wicked schemes of the demons and devils to show the reality of the situation for the characters and to show that they want to kill, steal, and destroy all that is good in the realm. No different from our own world in a lot of ways. In the realm of Ruauck-El, I created the satan figure as The Dark Lord with his following demon army called Reegs. We will learn more about this Dark Lord in the second and third book, but in all accounts I am mirroring the Biblical satan. From the Admin: Thank you Brae, for sharing a little about you and your books with us! I really enjoyed reading your interview! 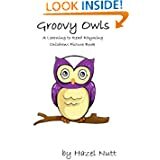 Hazel Nutt was our Featured Spotlight author last week and vistors were encouraged to ask Hazel some of their own questions! Here is a link to that Spotlight! Feel free to ask more questions, and we might just be able to get Hazel back for a follow up interview! Hazel, it is amazing that you already know how to read, write, and have your own blog even before pre-school! How do you do so much at such a tender age? I will let you into a secret, I don't actually know how to read or write, (or even speak that well yet) but what I can do is twist my parents around my little finger, so that they create everything in my name, so I can reap all the benefits and rewards of being an successful author. I have also made them understand my mumblings, gestures and looks, so that I can actually claim the ideas for the books do come from me! Are you sure that you are not mind controlling your parents? I mean are they having terrible two tantrums as well when you get upset? I am not going to deny mind controlling my parents! I am the epitome of "When she was good, She was very, very good, And when she was bad she was horrid!" They try their best to keep me happy most of the time. Bless 'em! And oh yes, they sometimes have tantrums too, as it makes me stop mine and I laugh at them!! How do mummy and daddy find the time to help you write up all your ideas and turn them into books when they have you to look after? How much of an active role do you play in the process? Mummy and Daddy are burning the midnight oil to make me a successful picture book author, as during the day if Mum attempts to go on the computer, I shout "off, off" at her (unless I'm having a poo and that often gives her 20 minutes to answer the odd email)! Same if Daddy or Mummy tries to use a pen or pencil, I'll grab that out of their hands too! I do want to be a successful author, honestly! Mum being eight months plus pregnant means she can't sleep well anyway, so she is happy to be up all hours making me a famous toddler author! I think there might be a little break taken, when the baby arrives, until we can all find our feet again! I don't take too much of an active role - I just supply the ideas and inspiration (and plenty of it). P.S. Congrats on your upcoming role as a big sister. Do you think she'll write books too? Since you are "Hazel Nutt" aren't you afraid of being eaten by nut loving squirrels? I'm a little girl silly! I'm not a real nut! Seriously though, I have I promised the squirrels who helped me create these books a good supply of nuts over the winter, to be paid out the royalties of these books, so I'd better sell some or else I might be in trouble! I have started to make markings that look like writing on my Etch-a-sketch, but when it comes to writing the picture books, that's my Mum's domain. She says that I inspire her. She used to write a lot of angst poetry as a teenager, but the pen had lain dormant for years, until me, her precious muse made an appearance and she has found it's a lot nicer, to write about the happy fun things I inspire! Why did you choose squirrels as your first subjects? Squirrels are the first animals in the outside world that I really took notice of. Whilst being pushed in my buggy, I'd look up into the trees and see these little fuzzy balls of fur jumping from tree to tree, with their cheeky little faces, I just had to know what they were up to and so I kept watching them. My parents were looking ahead of them and missed all of the antics I saw (what I now know are called) squirrels get up to! When I communicated to my parents what I had seen, my parents thought it was such a novel idea, that they created three picture books in my name from it! 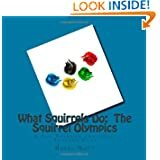 The next four installments of the What Squirrels Do Series will be what squirrels get up to in the different seasons (and how squirrels might even instigate some of the seasonal changes)! Who does the illustrations for your books? Can you tell us a little about your illustrator? My Daddy does the illustrations for the books. I sit and create something on my Etch-a-sketch and he makes it into the delightful illustrations that you see in the books! He can really spot all my wonderful ideas and translate them into just what I am seeing in my mind's eye! Of course, he has to remember what I drew on my Etch-a-Sketch as I won't let him sit and illustrate during the day. Oh no! I just give my approval in the morning. If you could travel anyplace in the world where would you like to go? I don't know. At the moment my little contained world is enough. I love the park, going to toddler groups, going on walks around my village, shopping trips and going on the bus. I have traveled to visit my grandparents and slept on a plane journey both ways to France (from UK). I suppose that I love beaches, so a lovely sandy beach, where I could dig with my bucket and spade and chase seagulls, that would be a lovely place to go. I get all excited when I find the bucket and spade hidden in the bottom of my toy chest, where I'm not supposed to see it! You do an awesome job at getting your parents to listen to you, do you have any advice for other children who might feel as though adults just don't listen to them? Rest assured, your parents do listen to you. Sometimes it seems like they don't, but it is only because they have your best interests at heart and love you so much. When I do something wrong, my parents explain the reasons why they are telling me off and why it is wrong, that helps me understand (doesn't always stop me doing it again, but I know why they don't like me doing it). You need to listen to your parents as much as they listen to you. It's all about the communication of unconditional love flowing both ways, but if you are toddler you have to be naughty sometimes, it's expected! What is Hazel Nutt's favorite cartoon? That's easy! I watch Peppa Pig as much as I can and have it playing in the background of my playtime, whenever I can get away with it. Funnily enough, my favorite cartoon film is Watership Down and there is a Hazel in it, imagine that! Actually it is where the inspiration for my name came from. It was Mum's favourite book as a child and she has always loved the name - Hazel. From the Admin: Thank you Hazel, for sharing with us your views into the world. You have two very talented parents who are able to translate your ideas into books that all kids should love! Come Ask Jaimie Hope Some Questions! I was born November 3, 1976 in New York. Growing up one of my favorite time of the day was story time. You may be asking yourself what's next. Only time will tell. Jaimie's Interview will go live On April 1st so do your research and come ask her some questions! Hi, my name is Hazel Nutt and I am a two year old toddler who is nutty about the outdoors and nature, especially squirrels. I like to chat to squirrels and they tell me their secrets. I also like to blog about my observations on life so far and teach other toddlers how to train their parents. My parents are my willing and sometimes unwitting guinea pigs! Other than that I'm a normal toddler, throwing terrible two's tantrums, trying and succeeding in wreaking havoc wherever I go. I live in Sussex in the UK with my Mum and Dad and I am an accidental writer! Well to be honest I don't actually write anything (I am only two), I just inspire my parents to write in my name! They had no idea of all the creative ideas that would come flowing to them upon my arrival. In Hazel Nutt's début trilogy of fun rhyming picture books, children are emerged into the imaginative secret life of squirrels. 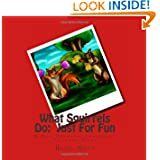 Ideal for an adult and child to read together the "What Squirrels Do" series combines imaginative rhyme with delightful illustrations. The books inspire little imaginations and instil the seeds of a lifelong love for reading and nature. Hazel's Interview will go live On March 26th so do your research and come ask her some questions! Jan Clifton was our Featured Spotlight author last week and vistors were encouraged to ask Jan some of their own questions! Here is a link to that Spotlight! Feel free to ask more questions, and we might just be able to get Jan back for a follow up interview! How long does it take you to write a book? I'm curious because I think there's a misconception about "children's" books being easier to write. Jan: I think it depends on how experienced you are as an author and whether the book is a picture book or chapter book. The idea for my first book came to me pretty quickly but then it took me a long time revising it and having it edited, etc. Another book that I wrote is a chapter book, Roland’s Stupendous Imagination And The Native Americans, and that took me much longer. I come up with my ideas fairly quickly. It is the editing and illustrating that takes such a long time for me. I think a picture book could be written and illustrated in a couple of months but then it depends how many corrections and editing it needs. I do think that most people do not have an idea how much work goes into writing a book and especially if you illustrate it yourself also. What made you specialize children's books? Jan: I love young children and have always loved picture books so it was a natural pairing for me. Also I am certified to teach young children and this further peaked my interest when I would watch a child's interest when they were shown a picture book for the first time with their eyes wide with wonder. Picture books are a young child's first introduction to literature so it is wonderful to think you might be opening a child's mind through your writing and illustration. Jan: It has to be seeing their face and expressions when you tell them you are an author and illustrator and watching how they enjoy my books. 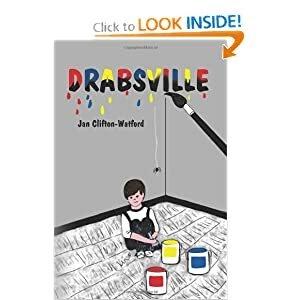 What did you learn from publishing Drabsville that you will use for future projects? Have you considered using collage to illustrate one of your books? Jan: Yes, I have considered using collage for illustration of some of my books. I do experiment with collage in my other paintings and will probably apply that experience to illustration also at some point. Do you also paint digitally? If so, which program do you use? Jan: Yes, all my illustrations for my children's book are done digitally. I use my IPad and my favorite drawing programs are the apps, Sketchbook Pro and Procreate. I like Sensubrush as a stylus that has both a brush and a short nib rubber tip. I have been using Pixelmater (Mac app) for sizing. I presently am taking lessons online for Painter 12 to help me better understand how to use it. I have to admit that I really love drawing on my IPad because it is so portable and a more natural action looking and drawing down instead of drawing down and looking up on a PC or laptop. The options offered on Painter are extensive though and I want to learn how to use it also. How long does it take you to do all the paintings for your books? Jan: It takes me much longer to illustrate my books than to write them. It usually takes me a couple of months to illustrate a book and make the corrections. Has your teaching helped you create your books? Jan: My background in education has definitely influenced my books and all of them are educational. My desire is to entertain a child and educate through my books. Jan: Yes, I do and I think all artists and writers do. It seems to affect me the most when I am stressed or upset. Are your illustrations inspired by your writing or is your writing inspired by your art? Jan: Both. Often I will get and idea for a book but then need to start sketching to get the idea of what the characters will look like. That helps me format the story. Do you have many books in the pipeline? Jan: Yes, I have two in the works now. Both are educational picture books. I have ideas for a couple more. 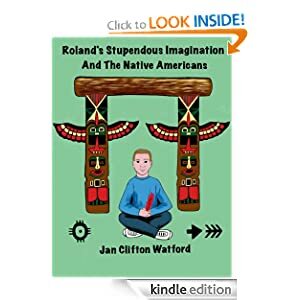 I also am working on a revised version of Roland’s Stupendous Imagination And The Native Americans, which will include more illustrations and digital interactivity. From the Admin: Thank you Jan, for sharing with us your amazing insight into writing and illustrating books for children! Brae's Interview will go live On March 25th so do your research and come ask him some questions! 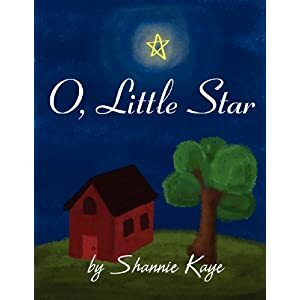 Shannie Kaye was our Featured Spotlight author last week and vistors were encouraged to ask Shannie some of their own questions! Here is a link to that Spotlight! Feel free to ask more questions, and we might just be able to get Shannie back for a follow up interview! * First, I think your mission is admirable and I too believe laughter is the best medicine. I write adult comedy which is fairly easy as I'm an adult (although my wife begs to differ). How to you go about learning what today's youngster will chuckle at without going over or under their heads? Thank you kindly, Stephen… We must always remember that our children are our future and that we must all do a part to support and help them along the way. Well, here I am to try and do my part. You see, if only one sad or unhappy child smiles or giggles while reading one of my stories - I feel my job is done. I find the hardest part of writing for children to be ‘keeping it simple’, since I am a perfectionist and sometimes put too much thought in my writing. I try to stay away from more complex messages and thinking processes when writing for kids. I must always remind myself that a child’s attention span is much shorter than an adult’s; I keep my mentality comparable to the child’s age that I am writing for specifically because a child’s imagination and creativity can be limitless... particularly when there are certain ‘obstacles’ in that child’s life – he or she tends to escape into the imagination. 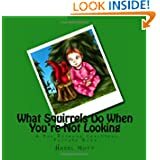 No, unfortunately I do not; my publisher offers free illustration for children’s books and although I am happy about how the illustrations for my books have so far turned out, I would surely have done it myself if I were a better cartoon artist. I also love Greek mythology; in fact, I studied it in high school using the textbook, “Mythology”, written by Edith Hamilton. My favorite story is about Icarus and how his father, Daedalus – the great inventor and architect, made them both a pair of wings to escape the Labyrinth that King Minos had thrown them in. He told his son ‘escape may be checked by water and land, but the air and the sky are free’ and before they took flight, Daedalus warned Icarus to keep a steady course above the sea; if he flew too close to the sun the glue on his wings would melt and they would fall off of him. As the two flew swiftly and without effort, the new ‘power’ of flying went to the boy’s head and he continued to fly higher and higher… paying no attention to his father’s warnings. Icarus then flew too close to the sun, which melted the glue on his wings, and he fell into the ocean. There is much more to this story but it is a classic example of how children may disregard what their elders tell them while presenting a moral to the story about having to suffer consequences for their own actions. I am 1/8th Choctaw, so Native American Folklore also intrigues me. “American Indian Myths and Legends” by Richard Erdoes and Alfonso Ortiz is a wonderful collection of diverse and comprehensive stories ever compiled into only one book. 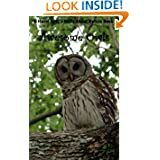 I would find it difficult to locate all of them, since there are so many tribes and different bands of Native Americans, but this book surely gives us a newer look at older traditions. Some of my favorite legends originate from the Chippewa (Ojibwe); it basically tells of both Mackinaw Island and the Manitou Islands – where human souls were thought to reside after their death. You posted some good questions! As I stated earlier, I do try to keep it simple as I write to ensure I do not lose the little reader’s interest. I also try to include somewhat of a moral or (at least) a life lesson in each story as well. I am a firm believer that while teaching – to include musical or rhyming in the lessons because it is more effective – besides, it makes it more fun! As far as my mission goes, I want to bring laughter to anyone suffering because I love to laugh; laughing makes you feel better and helps to overcome sadness. Both myself and my oldest child were victims of child abuse (his experience was unfortunately far more violent and at the hands of his biological father) and I know first-hand exactly how sad a child can be when this happens. Children are resilient and are capable of overcoming so many things, but adults must remember that our children sometimes need a little help with ‘bouncing back’… Laughter is FREE and CONTAGIOUS. Sadly, I had no hand in setting the price of my books; my publisher has control over that aspect. In my opinion, they seem to be priced a bit high, but I am thankful that my books are out there. I have two more books in production right now: “A Snowman’s Love Will Never Melt” and “Funny Bunny”. I have always loved the night sky – the stars, the moon, etc. Sometimes kids are afraid of the dark and going to bed can be scary to small ones (as I was). When I was little I would look out the window at night and stare at the moon and study all of the stars. I would try and find the brightest star in the sky and pretend that it was watching over me as I fell asleep, keeping me safe until morning. This childhood experience of mine was the influence for “O, Little Star”. 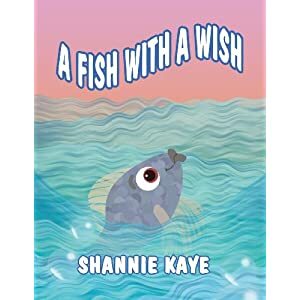 My second book, “A Fish With a Wish” was influenced by my son and his ability to overcome his prolonged injuries due to Shaken Baby Syndrome at the age of two months. After his release from a two-week stay in the hospital back in 1986, he endured many therapeutic appointments for many years and it has been a long, hard road but today he is in his twenties and thriving, since he does not let his limitations and handicaps hold him down. I have always told him to ‘never give up’ and to ‘try it once before saying you can’t do something’; truth be told… it is hard to keep up with him these days and he loves to laugh and tease to the point where I can only roll my eyes. 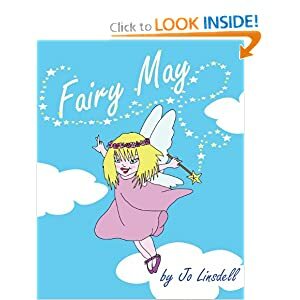 I would hope that anyone with a desire to bring laughter and happiness to a child that needs it would take just a moment to use one of my stories to help them along the way. * Your bio note says you like laughter, beaches, horses, the night sky and snowmen. Could you envision writing a story about a laughing snowman who rides a horse down the beach at night? Jan Clifton Watford's interest in art began as a very young child. Through childhood she studied privately with several art teachers and was recognized with several art awards. Education includes Florida State University, Georgia Perimeter College, and a Bachelors of Visual Art from Georgia State University. Graduate work includes a masters degree in teaching and learning with specialization in integrating technology in the classroom from Nova Southeast University. For many years she taught art from her home and then from her own retail store that also included wholesale and retail sales, and arts and crafts. Her original designs for the gift market industry have sold nationally and internationally. She taught public school for eleven years with the last eight years in elementary art to inner-city children. In her retirement, she is enjoying pursuing her interest by furthering her involvement in fine art painting in water color, acrylics, and collage and in writing and illustrating books for young children. Her first picture book, Drabsville, was published in the summer of 2012. Her first chapter book,"Roland's Stupendous Imagination And The Native Americans" was published as an ebook in September of the same year. In 2012 she also was awarded with the honor of becoming a lifetime member of Who's Who Worldwide. Ask Shannie Kaye Some Questions! Laughter is the best medicine, so her hope is to bring laughter to victims of crime - especially children. NOW then Shannie's Interview will go live On March 11th :). Jo Linsdell was our Featured Spotlight author last week and vistors were encouraged to ask Jo some of their own questions! Here is a link to that Spotlight! Feel free to ask more questions, and we might just be able to get Jo back for a follow up interview! I used to be a model and actress. Nothing major but it was good fun. Most of the modelling I did was for hair stylists and for make up and it was interesting seeing how other people would transform me. As for the acting I did mainly theatre. I guess I've always been the creative sort. I had more jobs than just those listed here too. I was a waitress, a credit controller, a shop assistant... I even worked very briefly as a hairdresser. I actually did a lot of these jobs all at the same time though. I'd be a tour guide in the morning, teacher in the afternoon and cover reception at a hostel in the evening. I was basically just filling in until I found what I really wanted to do. I've always been a bit of a free spirit. 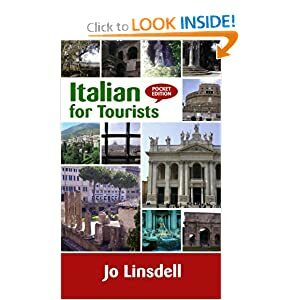 I wrote my first book Italian for Tourists because so many people asked me to write it. That simply really. When I was working in the hostel I'd get told by someone at least once a day that I should write a phrasebook for tourists. I didn't think much of it at the time. Then in 2005 I saw an ad that an English language newspaper in Florence was looking for articles and at the time I was writing research articles for the Neurology department of a hospital here in Rome. I figured I'd give it a go and write about something that actually interested me for a change. They printed it in the next issue. This was the turning point for me and made me realise I could write about stuff I liked. As I was still getting requests for a phrasebook I decided that would be a good place to start. 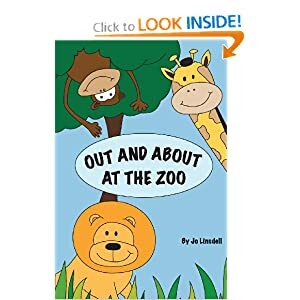 Out and About at the Zoo is based on the first time I took my son to the zoo. I wrote it after he asked me why I hadn't written a book for him yet. I figured he made a good point. 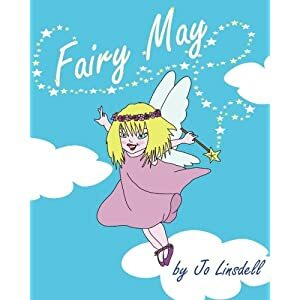 Fairy May came about because my niece saw I had dedicated Out and About at the Zoo to my two sons and she asked if I'd write a book for her too. It had to have fairies in it. The inspiration for the tooth fairy theme was caused by the fact that my youngest was teething. My eldest had also had friends from school losing their first teeth and so teeth was a hot topic in our house. My kids are definitely a constant font of inspiration for me and have given me plenty of other ideas to work on for future releases. Giving it the right message whilst making the rhyming text fit and at the same time telling a story that would appeal to young kids. When writing in rhyme it's not enough that the text is rhyming. It can't sound forced. You can't just insert a word because it rhymes. It has to fit the story too. The first draft of Fairy May had a different feel to it. It was rhyming and basically the same story but the message that came across wasn't quite what I was after. I rewrote most of the second half to make the emphasis more about not giving up and achieving her goals as opposed to just passing the test. That writing for children is lots of fun and very rewarding but far from easy. I'm currently working on two non-fiction books The Writers and Authors Guide to Social Media and Virtual Book Tours. I also have another two children's picture books in the works; The Bedtime Book and the first book in The Adventures of Nappo and Lollo series. I'm very flattered by that title but I'm far from Royalty. I am a social media junky though. My favourite platforms are Facebook, Twitter and Google+. I'm going to be developing my presence on YouTube this year too. With so many sites available it's hard to not give into temptation and sign up for them all. I'd rather have a strong presence on a few though than spread myself too thin. The best thing about social media is that it's SOCIAL. It's just not possible to be constant and interact with that many people, in that many different ways and places, all at the same time. Quality is better than quantity. Loads I think maybe the biggest bit of advice I can give though is to find a platform that fits you best and build on that. You don't need to be on all the platforms around and not all platforms will be suited to you or your audience. Research which sites your target demographic is using and look at how you like to communicate most. YouTube is fantastic and 2013 has been dubbed "the year of video" but not every author will feel comfortable in front of a camera or have skills that allow them to frequently produce quality content. My niece wanted me to write a book for her and, on her request, it needed to have fairies in it. As my youngest had been teething the tooth fairy came straight to mind. I wish I still believed in the Tooth Fairy and all the other characters like her. When you can still see magic like that the world is a better place. I hope my kids don't grow up too quickly so I get to indulge in the Tooth Fairy, Father Christmas and all those other wonderful characters for a while longer. Writers' block isn't something I've ever had to deal with. I'm always working on multiple projects and so if I'm not in the mood for writing one I work on the other. I guess I'm helped by the fact that I write multiple genres. From the Admin: Thank you for sharing your answers and your multiple talents with us Jo! Ask Robert Fuller Some Questions! Robert is an avid fan of the cultural history of vampires, which makes his debut, Valerie: Daughter of the Dragon, the perfect way to launch his writing career. Robert was born and raised in Northeast Ohio, at a time when television offered up late night showings of old horror movies. Not only did Robert gravitate towards the motion picture vampire, but also the vampires depicted in the writings of Stephen King, F. Paul Wilson, and Robert McCammon. At 18 years old, Robert went to work at JC Penney's where he spent a decade in the Visual Display Department. Robert's love of vampires and working in the retail/fashion industry provided the inspiration to create his own vampire story. After several years of writing and re-writing, Valerie: Daughter of the Dragon was born. When Robert isn't obsessing over his writing; he can be found taking in a movie, or two, or even three at his favorite local cinema, relaxing and listening to his extensive music collection, or cheering on the Ohio State Buckeyes. Robert is a big sports fan, but prefers football and baseball to all other sports. His favorite pastime is participating as team owner and Commissioner of a fantasy football league. Robert's other love is to spend time at the ocean. At least once a year, he and Jackie pack up and head to the warm relaxing beaches of South Carolina. 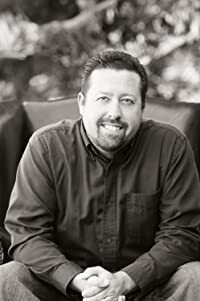 Rob Fuller on Amazon's Author Central! NOW then Rob's Interview will go live On March 4th! Born in Gillingham, Kent (UK) in September 1980. 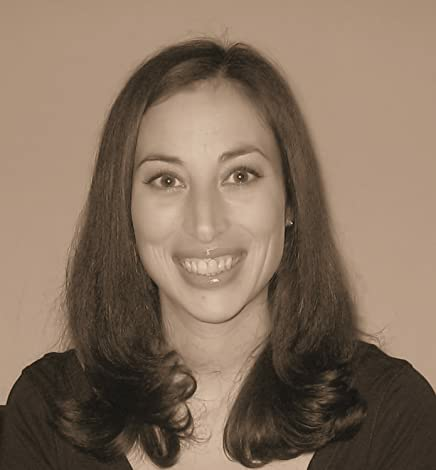 Married name Joanne Denise Feliciani. She uses her maiden name, Linsdell, as her pen name. Having passed 10 GCSE's, she went on to study Business Studies, History and Art A-Levels at Yateley 6th Form. She left England and moved to Rome, Italy in June 2001, where she now lives with her Italian husband and their two young sons. She has had various jobs including working in hostels, being a tour guide and teaching English as a foreign language. She now works full-time as a freelance writer. She writes regularly for various websites, newspapers and magazines. 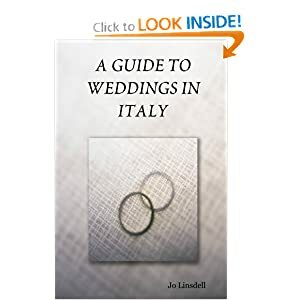 She has published three books in print 'Out and About at the Zoo', 'Italian for tourists' and 'A guide to weddings in Italy' as well as various ebooks. I'd also like to add that she is the organizer and host for a yearly online event called Promo Day, which is an online conference for anyone in the writing industry- you can find out more about that here. 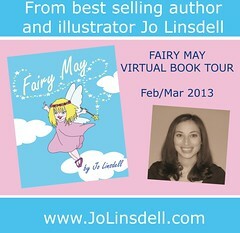 She is also currently on her Virtual Blog tour to celebrate the release of her newest book Fairy May! You can check out her tour here! WHEW! I really don't know how she does it! Jo is no stranger to interviews so feel free to ask away! 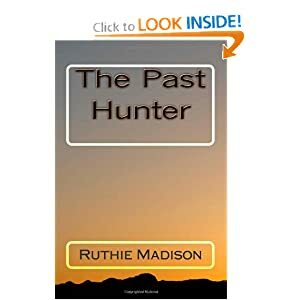 Ruthie Madison was our Featured Spotlight author last week and vistors were encouraged to ask Ruthie some of their own questions! Here is a link to that Spotlight! Feel free to ask more questions, and we might just be able to get Ruthie back for a follow up interview! In my first book Marge is a little of me. We both like to write. We both feel trapped in the situations that we are in. I try to stick myself in my stories because it is the only way I can be fulfilled. I imagine myself being Marge or Julie. As for Past Hunter, there is a little of me in it to—We are Christians who depend on the Lord to help us make decisions. The only thing both ladies have that I don’t is a man trying to gain my affection. The heroes in my stories are the kind of men I like to date. I thought writing was easy until I am told I have to show and not tell and according to “Slow The Prose” writer not using “to be” verbs as much and writing became hard. However, after reading someone’ else’s book and saw she had used “to be” verbs from time to time, it wasn’t so hard. The hardest part is marketing my book. I have the hardest time trying to get bookmarks and business cards just right. Another hard thing is getting book signings. From what I learn from another website is not having it in bookstores. As surprising as that might be, the book sellers think your book will be competing against other books. This is in Independent book stores. For national bookstores it is even worst. Look up this website for more information: http://blog.infinitypublishing.com/bloginfinitypublishingcom/bid/44632/The-Best-and-Worst-Places-to-Sell-Your-Book/ I had planed to do my next book signing at Bereans Bookstore until I read why that is a bad place to do one. In the photo is one done at the Library which is also not a good idea. People come into check out books. Not to buy them. I had little success. I asked in the group (Where Writers and Authors Meet) where would be a good place and the answer came back as anywhere with four walls and lots of traffic. Another author suggested coffee shop. When you go to do a book signing, bring some bookmarks and or business cards to hand out. Hi, Pam. I love cowboys and so I thought it would be cool if I write a story with a cowboy in it although Eric is a rancher. I wanted The Past Hunter to be a little bit suspenseful and I believe it started out that way, but I have always been a romantic too. 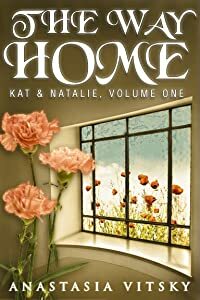 When I started writing, I thought my books would just be Christian Fiction but they always turn out Romance. I think the main reason is to fulfill some kind of desire in me. It was asked earlier if there are any autobiographical elements and I can only say that I wish I was my heroine. I like to crochet and read when I am not writing. I know exactly what you mean and it goes against my Christian nature to be explicit like the 50 Shades of Gray book or Harrlequin books. I read up on some Christian Romance books to see how they are written. It could also be because I don’t have any impure thoughts and so it doesn’t come out in my writings. Everything seemed to be intact as she looked around but she sensed a presence which sent shivers up her back. Her heart began to race as she heard a familiar voice. He has found her and now she must pretend she does not know him. “Relax. I am not going to hurt you. I wouldn’t dream of it,” he said as he quietly walked up behind her. Did he have a gun? She wondered. Remembering 8 years ago, she would not be surprised if he did. God, help me! She wanted to cry. “You are as beautiful now as you were eight years ago.” He said, brushing her hair back. “Who are you? What do you want?” She tried to be brave, knowing Jesus was on her side. She felt a chill going up her spine. She did not want to admit it but he was telling the truth. Oh how she wished he would leave. In Past Hunter, Julie is a spirit filled Christian meaning, that she has the Holy Spirit in her. Although all Christians do, not many will acknowledge the Holy Spirit in their lives. People will pray to God or or to Jesus, but how many will ask the Holy Spirit for guidance. I haven’t read any Christian fiction where the Holy Spirit is mentioned. In the first chapter, Julie sensed in her spirit of an impediment danger. And later on she would have have dreams that were served as a warning about someone else. People Get Ready By Crystal Lewis- and I would share it with my friends. Any songs by my favorite worship leaders. I am reading The Land of the Noonday Sun by Carmen Desouza. I just got done reading She Belongs To Me by the same author. I would recommend it. 10. Are you writing anything new? Whats next? I am working on the ButterFly and the Cocoon which is similar to my first book. 11. Anything else you would like your readers to know? My third book is called a Second Chance at Love. I am not sure when it will be published, but I will let them know. I am waiting for my cover design to be ready and will be sending out my manuscript to an editor. From the Admin: Thank you for sharing your answers with us Ruthie! Great interview! Ask Edward Frank Some Questions! My name is Edward Frank. I write science fiction and fantasy stories reflecting a lifelong love of the genres. Most recently I published a fantasy role playing game Knarf 4, available through Amazon Kindle. I have an extensive science fiction and fantasy library and have long enjoyed table top role-playing games. Not satisfied with commercially available games, I started creating my own game variations in the mid 1980's. Knarf 4 is latest version best version of those games. I also write non-fiction. I currently am working on a book on "The Old-Growth Forests of Cook Forest State Park, PA" targeting older children and teens. By training I am a geologist with published research on caves found in the United States, the Bahamas, Puerto Rico, and the Dominican Republic. I am the webmaster, BBS administrator, and run the Facebook Page for the Native Tree Society and am involved with tree research with the group. 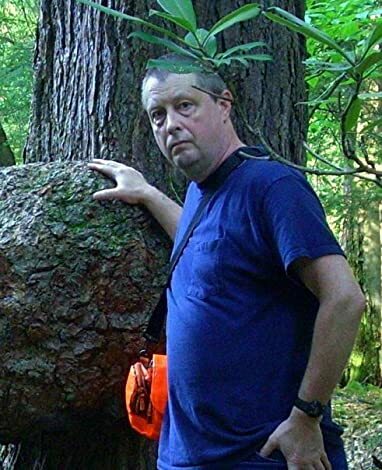 I am the author, or coauthor, of a number of tree related articles and publications available for download from the NTS website and NTS BBS. I edit the monthly magazine for the group - eNTS Magazine. I am suave, sophisticated, funny, kind, considerate, thoughtful, brilliant, devilishly handsome, and above all modest. Ask Pam Funke some Questions! I know her as Pamela on Facebook- but she also goes by Pam. I am the proud grand-daughter of a pastor and have spent the majority of my life in the church. I am a Christian author who enjoys writing many different things. My love of reading and writing led me to write for the enjoyment of others. Why did I choose Christian novels? Well, mainly because there are hardly any Christian novels out there anymore and the books that are filling the shelves and homes of adults, young adults, teens and children are not feeding their minds or souls with positive things. Now mind you there are some very good non-Christian novels out there that instill a positive message.There has to be something in a good book that not only feeds the mind with positive values and teaches the reader how to improve their life and give them some hope, then what's the point? A good book should have a lesson in it that someone can learn something valuable from it and not just an escape away from their problems in the real world~ because when the story is over the real world is still there and so are their problems. They should be able to come out of that story with something positive that they can use to help them in the real world. While Operation Dark Angel is my first published novel, it is but one of many novels that will be available. This is the first installment in The Four Horsemen Series. There will be a total of seven books in this series. I have a few other series that I will be writing to include one for young adults and children. There will also be several single books.